Giving irrigators a licence to divert huge volumes of water is a recipe for disaster, opponents say. 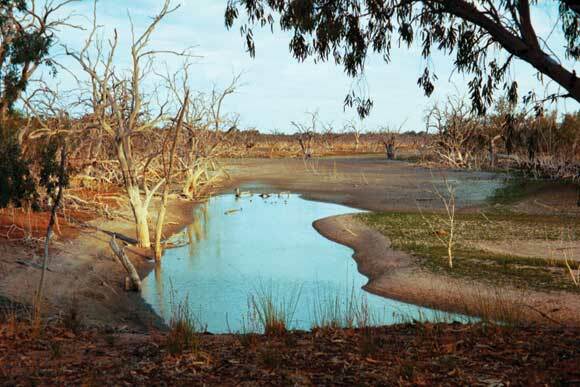 Aboriginal groups, graziers, environmental groups and the former commonwealth environmental water holder have urged the New South Wales water minister to halt a controversial move to allow Murray-Darling irrigators to “harvest” overland flows after rain events. Known as “floodplain harvesting” the practice has been unregulated and unmonitored in NSW, but is now diverting huge volumes of water in the northern basin of the Murray-Darling system into irrigation storages. The harvesting is done by building levees and canals which then direct flood waters into giant storage tanks instead of allowing it to make its way into the river or into the soil. The exact impact of floodplain harvesting is unknown but it is thought to be a major contributor the huge drop in flows in the Darling river, which has been highlighted following the deaths of hundreds of thousands of fish at Menindee in three separate events earlier this year. The NSW government has proposed granting free licences to irrigators to harvest overland flows and it then proposes to bring the level of harvesting down to “historical levels”. In an open letter to the water minister, Niall Blair, the signatories argue that giving free licences without a proper study is a recipe for disaster. “The NSW government proposes to issue free licences to return floodplain harvesting back to a historic level, but will not provide evidence of what that historic level is,” the groups said. “Floodplain harvesting is a major contributor to the fish kills and water crises that have appalled all Australians this year,” said Maryanne Slattery, senior water researcher at the Australia Institute. A spokeswoman from the office of Blair said the harvesting of floodwaters was a long-standing farming practice which has occurred in the northern basin for generations. “We want to ensure a fair system for everyone wherever they are and are working on a way to license this long-standing practice which will in turn provide a stronger compliance regime,” she said. The letter has also been signed by groups representing farmers along the lower Darling, as well as farmers in the Murray, who argue that floodplain harvesting is depleting flows further down the river system. “This year’s cotton crop in the northern basin will need about 3m megalitres of water. The majority of that water must have been captured off the floodplain, with no regulation, monitoring or control,” the chair of Southern Riverina Irrigators, Chris Brooks, said. He was particularly angry about proposals to use measuring sticks rather than modern meters, which are used in the Riverina. Badger Bates, a Baakandji elder, said the amount of water being taken by floodplain harvesting was “killing our Baaka (Darling) and it is killing our people”. The letter has also been signed by David Papps, who retired last year from the position of commonwealth environmental water holder. He was responsible for managing the government’s holdings of water which has been purchased to restore the environment of the Murray-Darling. The Academy of Science report on the fish kills said the number and size of off-river storages have continued to increase under the Murray-Darling Basin Plan. The number of cease to flow events have increased, increasing the risk of blue-green algal blooms and fish kills. There has also been a reduction in overbank flooding in the Darling River, which is essential to preserve floodplain forests, it warned. Floodplain harvesting and other water rules have deeply divided NSW farmers. The state member for Murray, Austin Evans, said he would be prepared to oppose his own party and cross the floor on the issue of floodplain harvesting in the northern basin. He dropped the bombshell at a NSW election forum in Griffith on Thursday where candidates fielded questions from members of the public. Water dominated the discussion with every candidate expressing their disgust at the total lack of monitoring around floodplain harvesting in the northern basin. Southern Riverina Irrigators, representing 1,600 farmers in the Murray Valley, has announced it is withdrawing its financial support for the NSW Irrigators’ Council. It has signed the open letter complaining about the governments floodplain harvesting plans. Blair’s spokeswoman said, “It is disappointing to see other graziers and in some cases water users, who also access river flows or are fortunate to have major dams in their catchments, refuse to recognise the property rights of fellow farmers upstream. “There has been a moratorium on new works in place for over a decade and this policy will ultimately result in a reduction in the water that will be available to farmers. Originally published by The Guardian, 7 March 2019.